Marcus Trescothick has rejected a second request by an England captain to come out of international retirement. The Somerset opener, 33, was asked by Test captain Andrew Strauss if he would be interested in taking part in this summer's World Twenty20 in England. "I had no choice but to say no," Trescothick, who quit the international game 13 months ago because of depression, told the Mail on Sunday. Former captain Kevin Pietersen tried to lure Trescothick back last summer. England have struggled to find an aggressive opening batsman for limited-overs cricket since his retirement and although Pietersen coaxed paceman Steve Harmison back to the England one-day scene after 18 months, Trescothick declined the opportunity. Trescothick, who holds the England record for one-day international centuries with 12, last played an international match in September 2006. He returned early from England's tour of India that autumn with what was described at the time as a "stress-related illness", missed the Champions Trophy but returned to the squad for the beginning of the 2006/07 Ashes tour of Australia - only to pull out nine days before the first Test. The left-hander formally announced his international retirement - after 76 Tests, 123 ODIs and three Twenty20 internationals - in March 2008 after withdrawing from Somerset's pre-season trip to Dubai. He subsequently revealed in an interview with the BBC's Test Match Special programme last summer that he had been suffering with depression and had been affected by anxiety attacks since the age of 10. "I might be wrong but I still believe that if it was as simple as turning up and batting for England, I could do it and succeed," Trescothick told the Mail on Sunday. "Playing cricket for England was the great ambition of my life and, until I became ill, I loved everything about it, so not being able to do so now is a source of great regret. "I miss the buzz and the stage and the chance to put my ability to the sternest test, and I'd be lying if I said I haven't thought about it often. "But I know in my heart that the dangers to my health of committing myself to all that goes with international cricket off the field are just too great. "Since suffering my own version of hell with the illness, I've come too far and made too much progress to put myself and my family at risk again. "I appreciate the thought and I know Strauss was not trying to put me under any pressure. "But the time truly has come for me to stop dreaming and face reality. As much as I'd love to have another bash for England, it isn't going to happen, at any level. "I really hope everyone can accept that part of my story is over for good. It is time for me and for England to move on." It was not clear when Strauss, who is not in the preliminary 30-man squad for the World Twenty20, made the request. England's squad will be slimmed down to 15 players by 1 May. 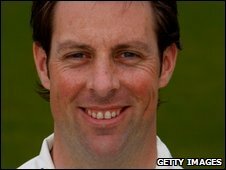 Marcus Trescothick will be speaking about his illness to Julian Worricker on BBC Radio 4's "You and Yours" programme on Monday, 13 April at 1204 BST.